This Monday is World Turtle Day. Could you, your school or work place do something to help the endangered species at the GSPCA. Olivia the loggerhead turtle after 2 months has finally started eating on her own and we are currently trying to raise either £10000 for a flight for her to the Canary Islands or looking for someone kind enough to help fly her south where she belongs. On Monday World Turtle Day celebrates turtles around the world and Olivia isn't the only turtle at the Animal Shelter as we also have two musk turtles in our care. Next Friday Herm will rock to help a very hard shelled lady. Playing a set 80s classic, Fade2Grey will be landing in Herm helping to raise funds for the very endangered Loggerhead Turtle that is in the care of the GSPCA. Last week the band visited the GSPCA to see the hundreds of animals at the Animal Shelter in St Andrews which included Bonnie the seal pup to baby birds, rabbits in need of homes to injured hedgehogs. 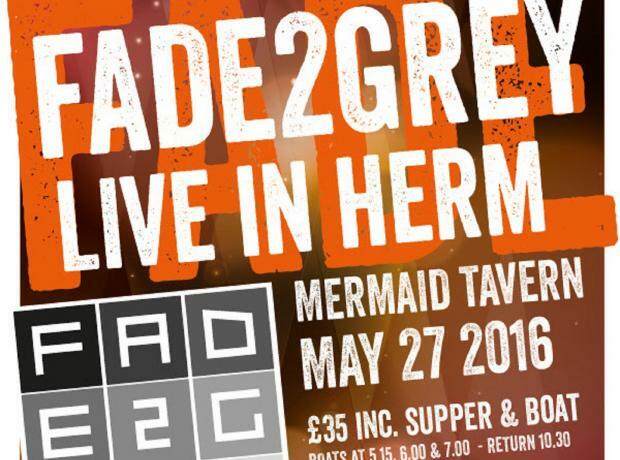 Fade2grey will be playing another outdoor charity show in Herm at the Mermaid Tavern on Friday 27th May. Priced at £35, tickets include supper, entry to the Mermaid (and the show of course) and a return Trident from Guernsey. Fade to Grey will be raising funds for the GSPCA and Les Bourgs Hospice and we are hugely thankful as the last event the held in aid of the Animal Shelter was an amazing event as each of their gigs always proves to be. On Saturday 15th November the World Premiere First screening of Fade2Grey's amazing live concert in Herm filmed in May 2014 was held at the Princess Royal Centre for Performing Arts. On 23rd May 2014, 80s electronica band Fade2Grey made history by taking a full concert rig to Herm Island and performing in front of 450 fans. The concert was filmed and has been released as a live DVD. The evening was in aid of GSPCA and World Vision. Doors opened 7pm on what was a very wet and windy evening. Each of the great crowd that attended received a free DVD of the gig. Friday was an extremely eventful day for the GSPCA. Having released the seal pups Eden and Trinity on Jethou in the afternoon, a fund raiser was being organised thanks to those on Herm and the Mermaid Tavern.